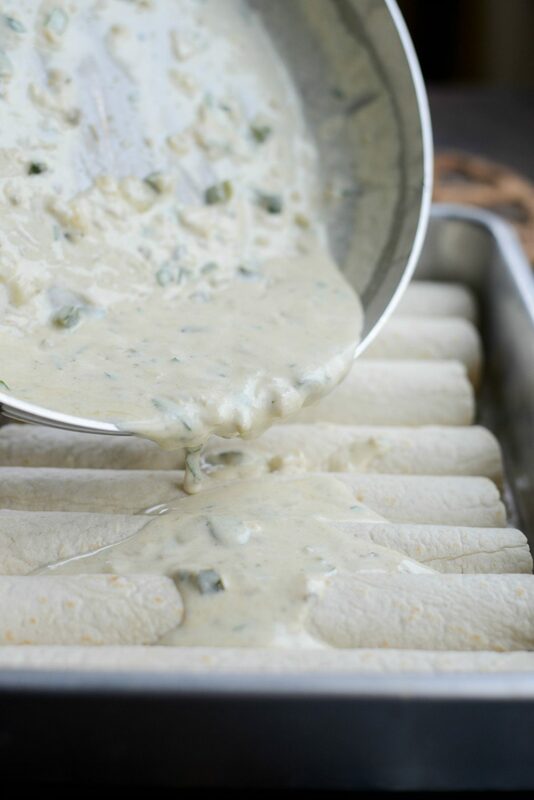 These Cheesy Beef Enchiladas Verde are a delicious take on traditional enchiladas. 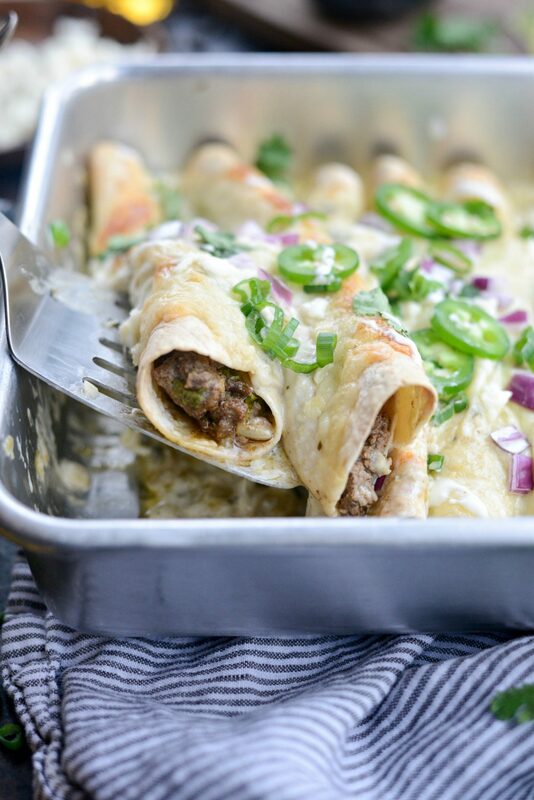 Seasoned beef tossed with a creamy salsa verde enchilada sauce is stuffed into tortillas, topped with more sauce and cheese before being baked until gooey and golden. 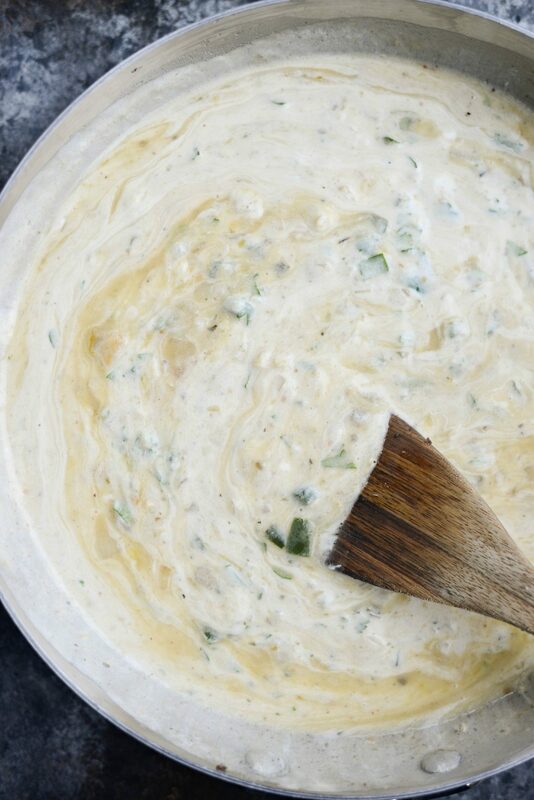 Deliciously flavorful and simple to throw together. Serves 4 in about 1 hour. This weekend was a good one. Friday Haileigh went to the Khalid concert with one of her best friends and Malloree had her 8th grade exit dance, so I did her hair and took way to many photos. Pat and I went to dinner and did some shopping, just the two of us – which was so much fun! Saturday we went out with our longtime friends, played some twilight golf (yes you read that correctly, I golfed) and afterwards we sat around for hours and ate and talked. It was perfect. So now that’s it’s Monday, I’m feeling rejuvenated for the week. We also had someone out to give us an estimate on central air. Thank the lord. But of course the weather is back into the 70’s and I can cook again. I know summer is typically about grilling recipes, when the weather dips to cooler and more manageable temps, I will use my oven. 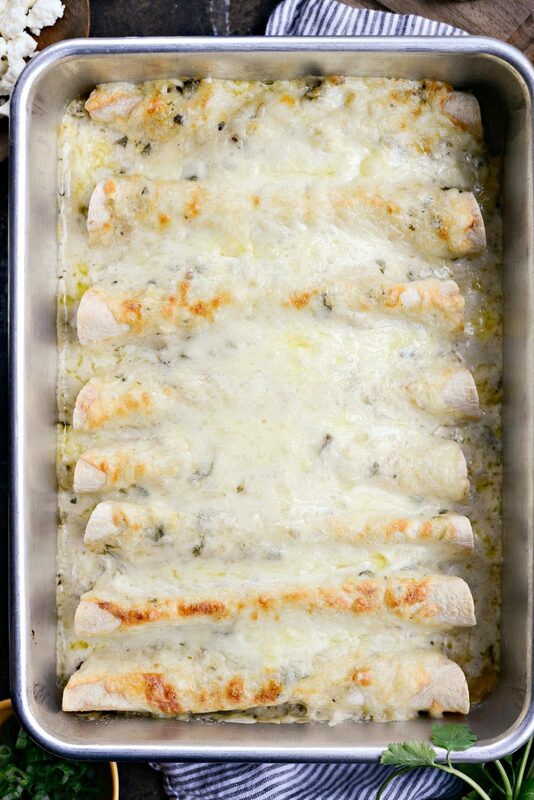 Especially for these cheesy beef enchiladas verde. Otherwise, I usually avoid the oven at all costs. The first time I made these, my family fell in love with them. I’m sure it had something to do with all the cheese and the fact that they’re pretty darn delicious. 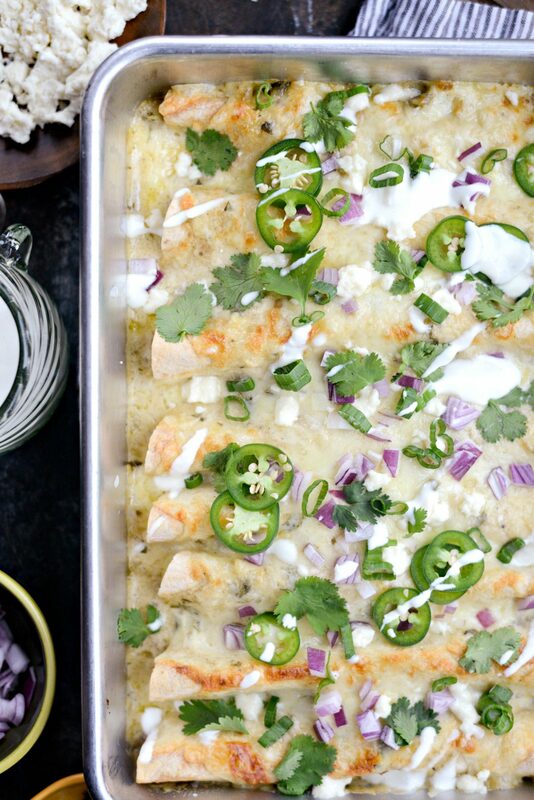 But I already knew they like salsa verde-anything because of this tortilla casserole. 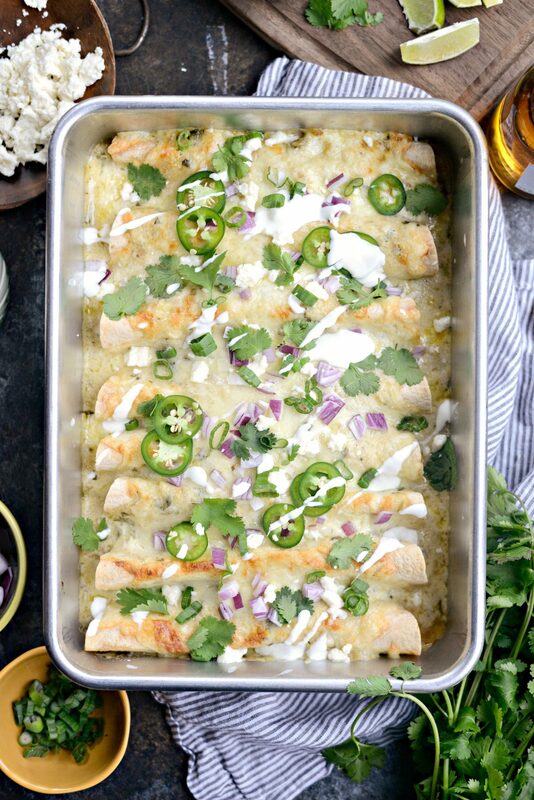 So I took my recipe for lighter chicken enchiladas and swapped out the chicken for beef and chipotle for homemade salsa verde, and these easy and cheesy enchiladas were born. The perfect dinner for any night of the week. 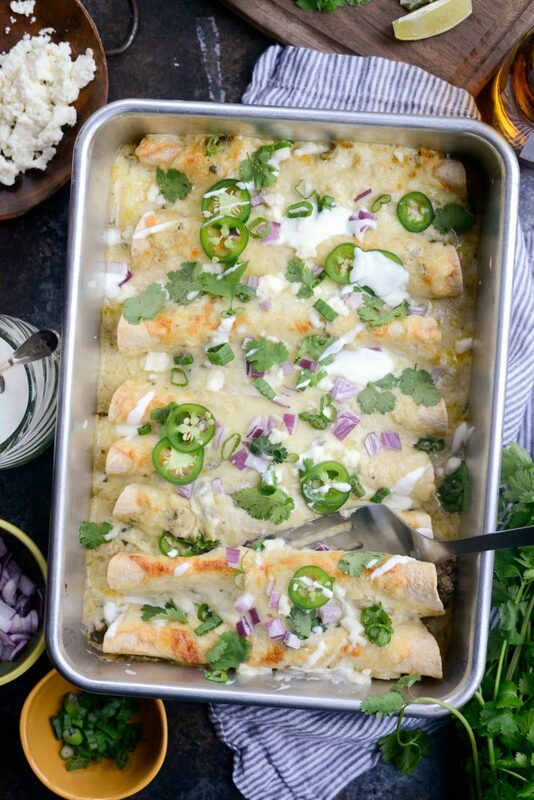 To make these cheesy beef enchiladas verde you will need; ground beef, ground cumin and chipotle powder, yellow onion, jalapeño and garlic, butter, all-purpose flour, low-sodium chicken broth, salsa verde, sour cream, salt and pepper, tortillas and Monterrey jack cheese. Sour cream, jalapeño slices, diced red onion, cilantro and quest Fresca for serving. 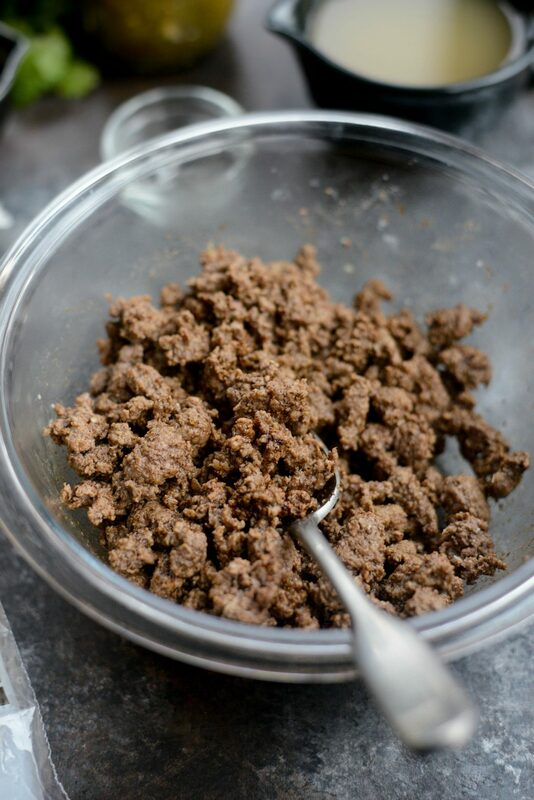 To start, in a large skillet cook 1 pound of ground beef until browned and no longer pink. Then drain off the fat and season with 1 teaspoon of both ground cumin and chipotle powder, stirring until combined. Next transfer the ground beef mixture to a medium bowl and set off to the side. 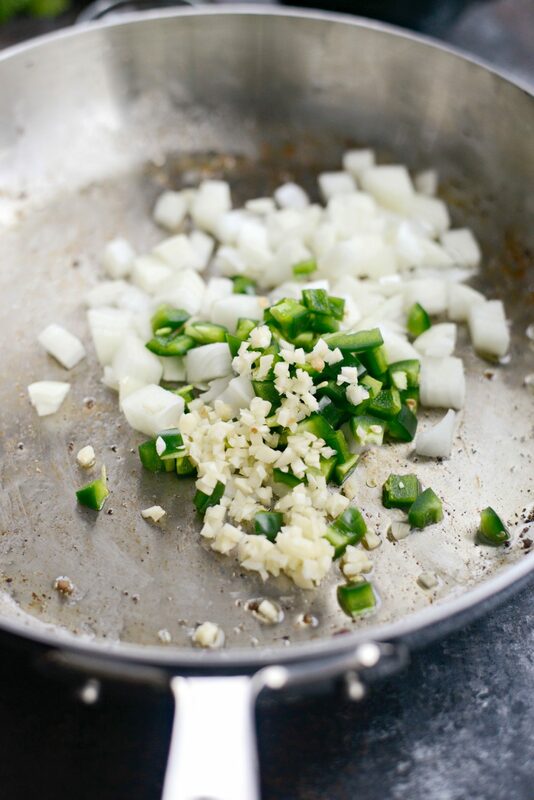 Then to the same skillet, add a teaspoon of olive oil and 1 cup of diced yellow onion, 1 diced jalapeño (seeds and ribs removed for less heat – optional) and 3 cloves of minced garlic. Stir until the onion and jalapeño are soft and the onions translucent. 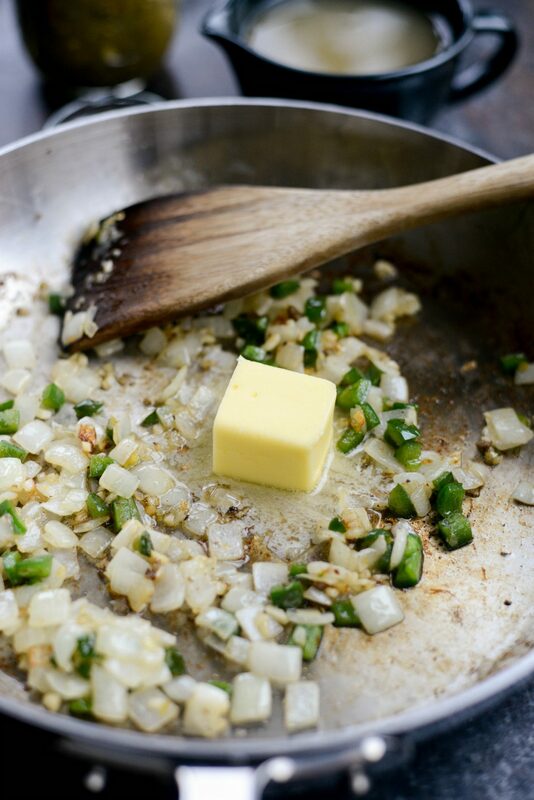 Next add in 2 tablespoons of unsalted butter, stirring until melted. 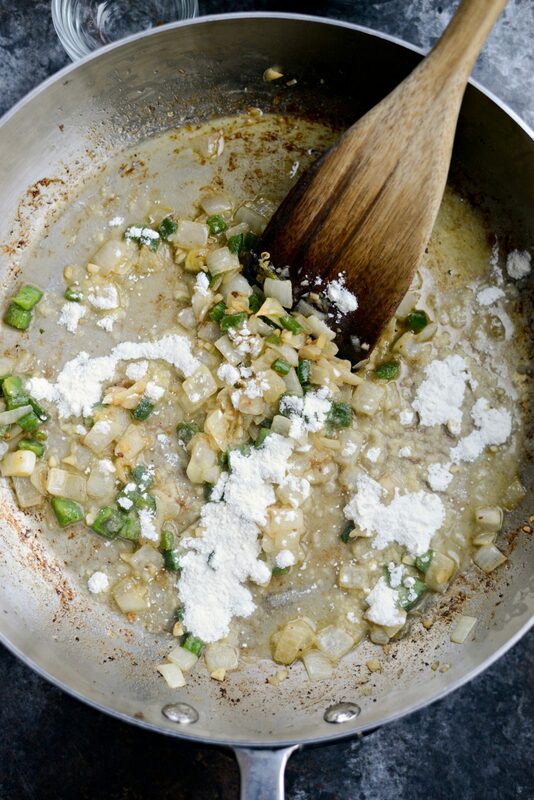 Then sprinkle in 2-1/2 tablespoons of flour, stir and cook for 2 minutes. Then continue stirring, while pouring in 1 cup of low-sodium chicken broth. Continue to stir until the sauce has thickened, about 2 minutes or so. Next add in 3/4 cup of salsa verde, 1/2 cup of sour cream and then 1/4 cup roughly chopped cilantro leaves. Stir until incorporated, taste test and season with salt to your liking. 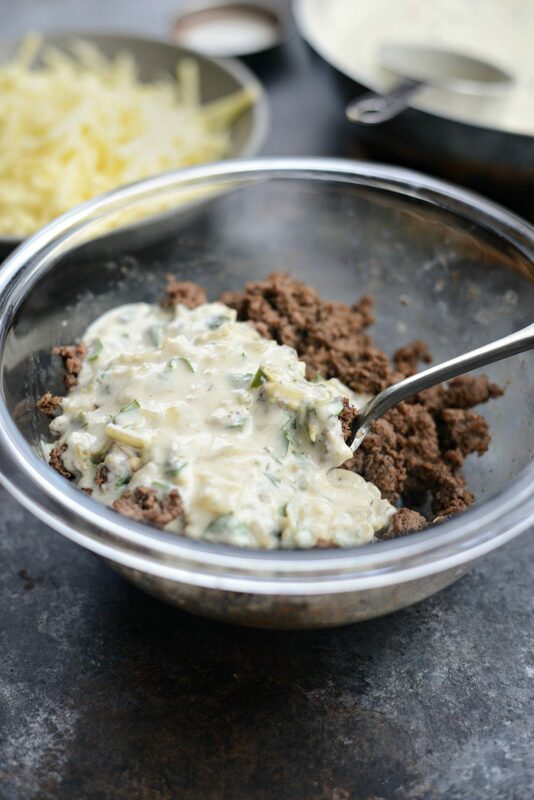 Then add 1 cup of the creamy salsa verde enchilada sauce into the bowl with the ground beef and stir to combine. 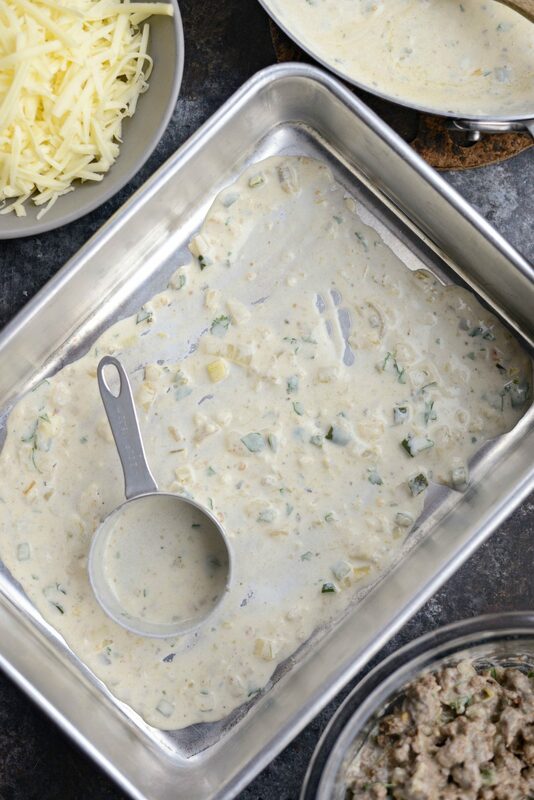 Next preheat your oven to 400° and then lightly spray a 9×13 baking dish with olive oil spray. Now spread 1/2 cup of the enchilada sauce into the bottom of it. 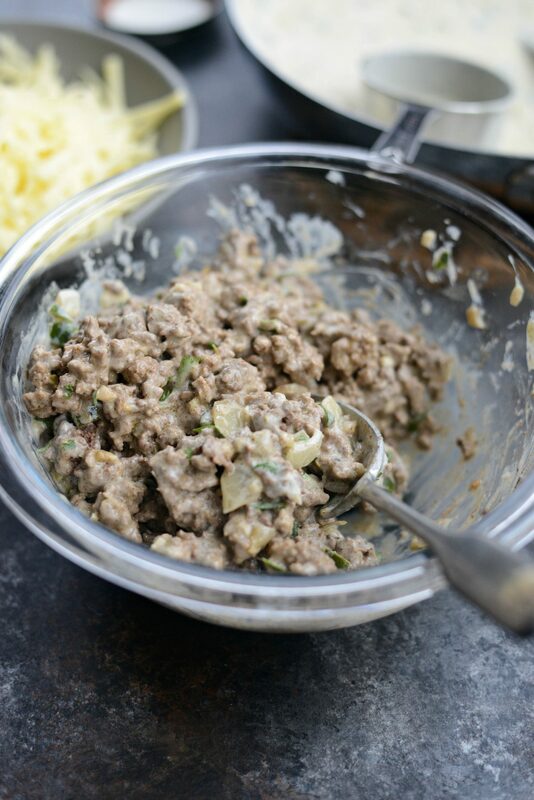 Add a couple of spoonfuls of the saucy meat mixture onto 1 side of a soft taco size flour tortillas (I used low-carb, but any will work). Starting on the side with the beef, roll and place it seam-side down into the pan and repeat with the remaining tortillas and meat mixture. Pour the remaining sauce that’s in the skillet over top of the rolled enchiladas and sprinkle with 1-1/2 cups of freshly shredded Monterrey jack cheese. 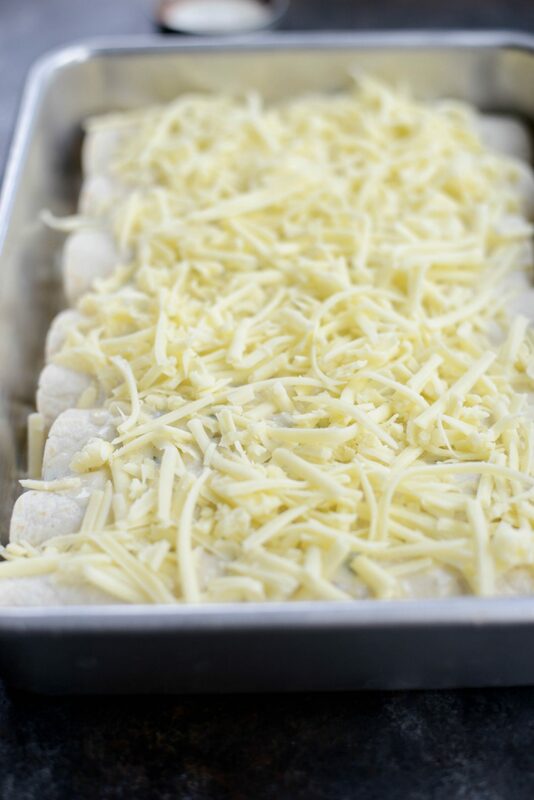 Bake in your preheated 400° oven for 12 to 15 minutes or until the cheese has melted. 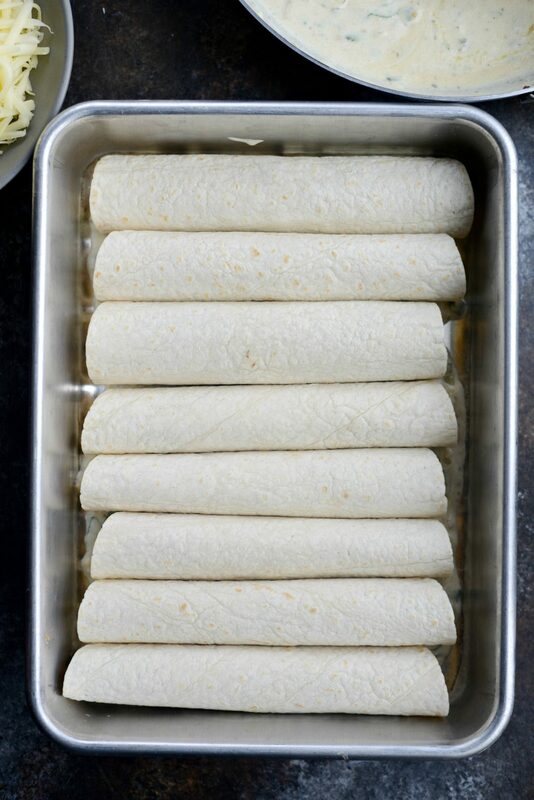 The enchiladas are done when the cheese is lightly golden brown and the edges of the tortillas are crispy. 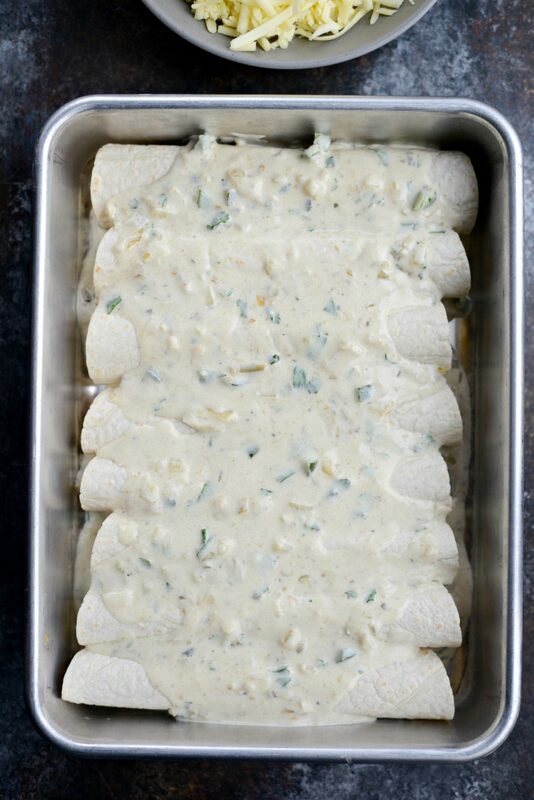 Serve with a drizzle of sour cream, diced red onion and/or sliced green onions, torn cilantro leaves and sliced jalapeños. Diced avocados would be delicious too! Enjoy! 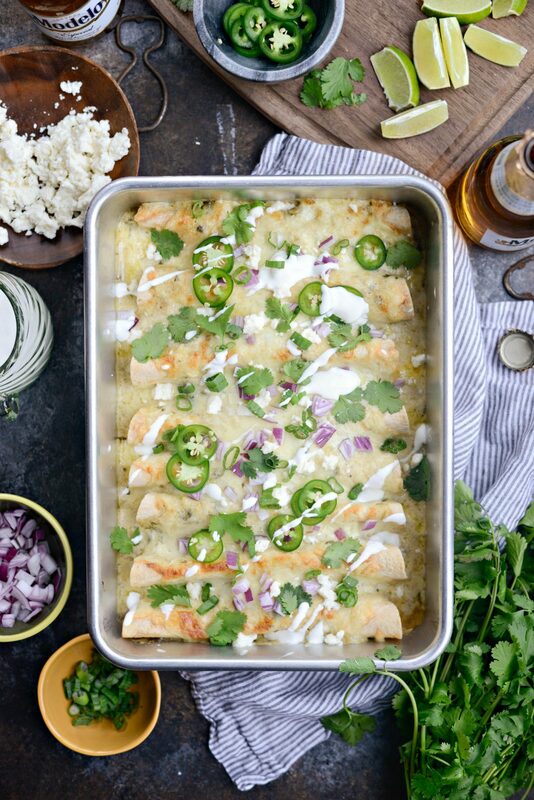 And if you give this Cheesy Beef Enchiladas Verde recipe a try, let me know! Snap a photo and tag me on twitter or instagram! 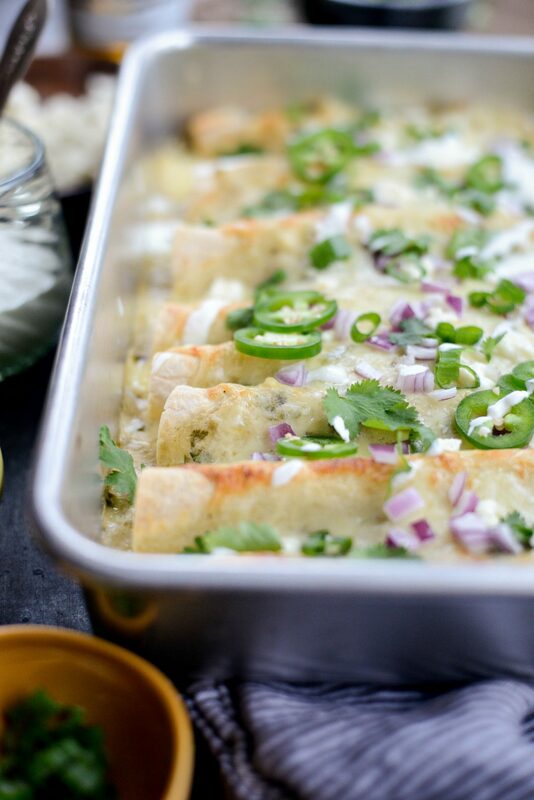 These Cheesy Beef Enchiladas Verde are a delicious take on traditional enchiladas. 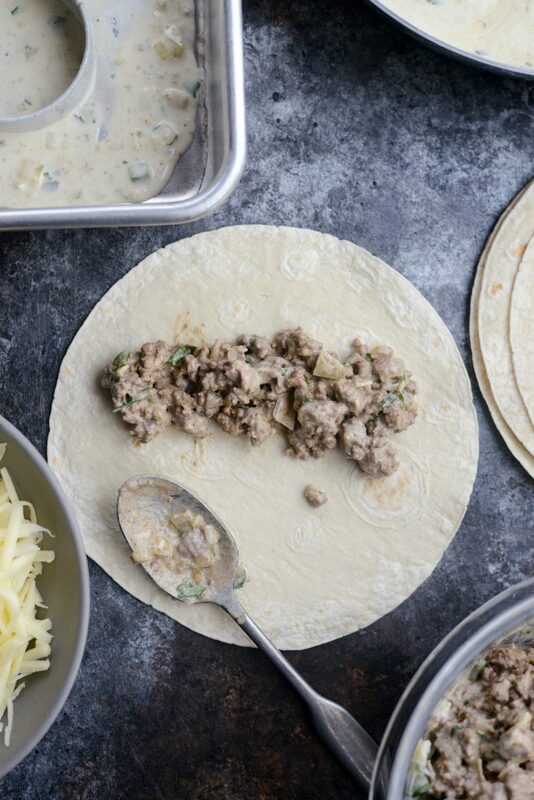 Seasoned beef tossed with a creamy salsa verde enchilada sauce is stuffed into tortillas and baked. 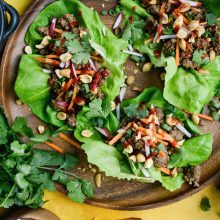 Deliciously flavorful and simple to throw together. Serves 4 in about 1 hour. Lightly spray a 9x13 baking pan with olive oil spray. 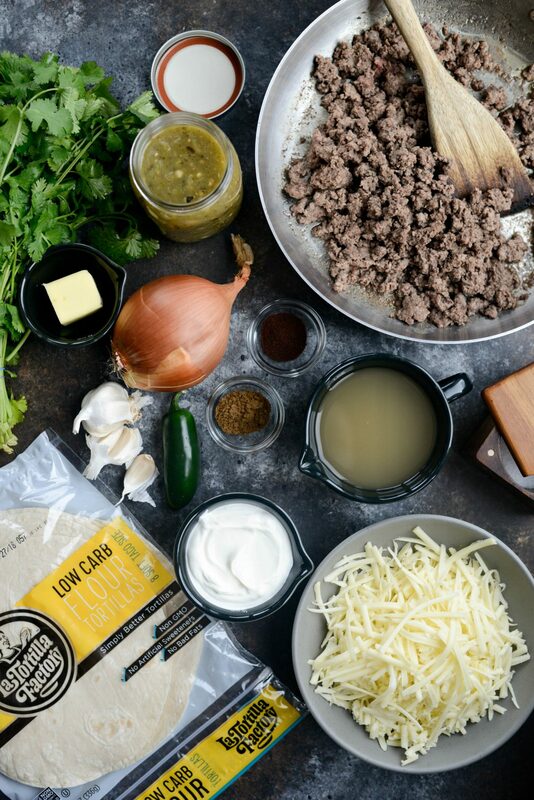 In a 10 to 12-inch non-stick skillet, cook the ground beef until browned. Drain and discard the fat before seasoning with cumin and chipotle powder. Transfer the seasoned beef to a medium sized bowl and set off to the side. 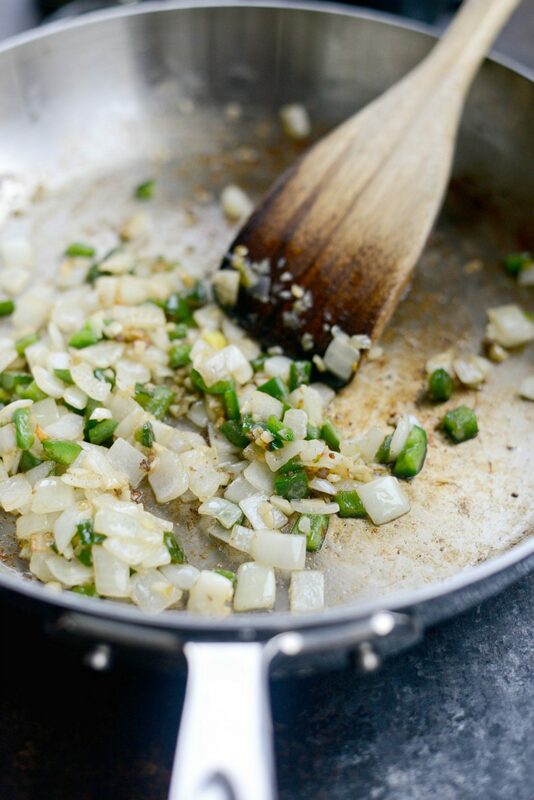 In the same skillet, add in the olive oil, onion, jalapeño and garlic. Stir until the vegetables are tender. Add in the butter and stir until melted. 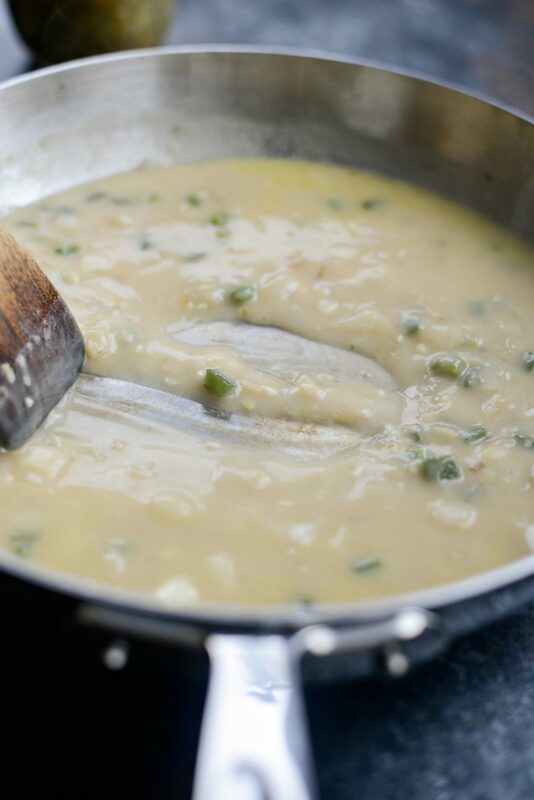 Stir in the flour and cook for 2 minutes before pouring in the chicken broth. 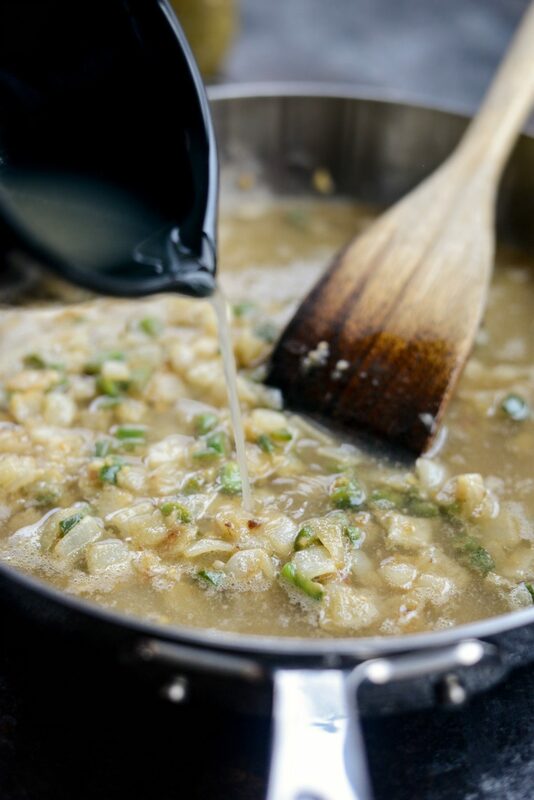 Stir until thickened, taste and season with kosher salt to your preference. 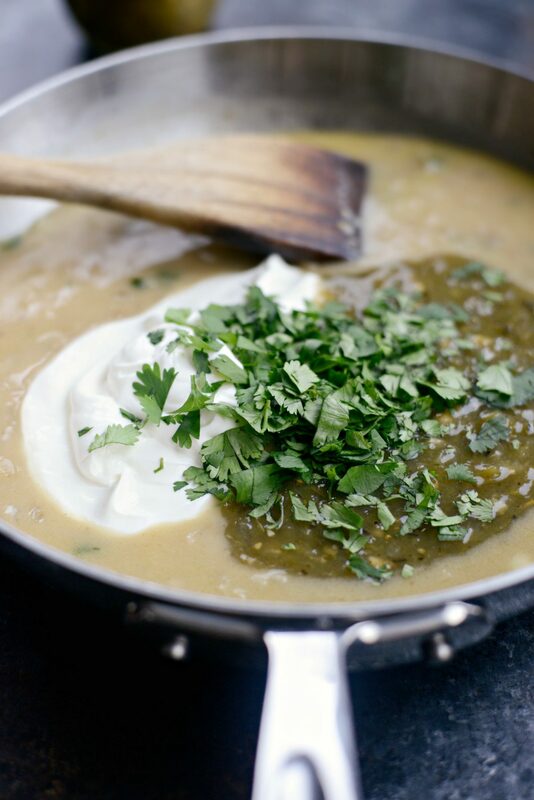 Add in the sour cream, tomatillo salsa and cilantro and stir to combine. Measure out 1 cup of sauce and stir it into the beef. Measure out 1/2 cup of the sauce and spread it onto the bottom of the prepared pan. 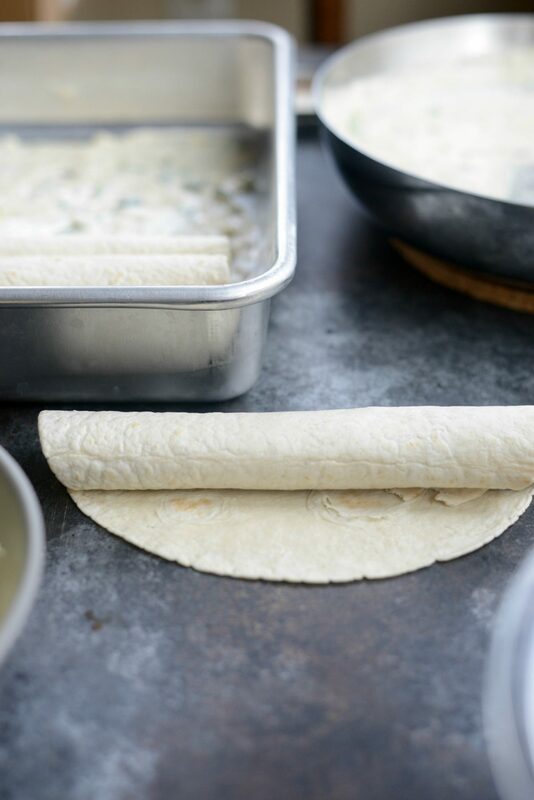 Place a few spoonfuls of the meat mixture onto one side of a flour tortilla. Starting on that side, roll the tortilla and place it seem side down into the baking dish. Repeat with the remaining 7 tortillas. Pour the remaining sauce (in the skillet) over top of the rolled tortillas and top with Monterrey jack cheese. 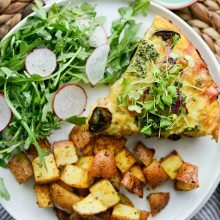 Slide the pan into your preheated oven and bake for 12 to 15 minutes or until the cheese has melted, is golden brown and the edges of the tortillas are crispy. I would never in a million years have tried to tackle making my own sauce for enchiladas! 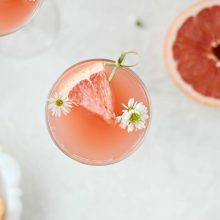 But this looks so delicious, I can’t wait to try it! Thanks, Laurie! Oh it’s so easy! I hope you enjoy the recipe, Jane! 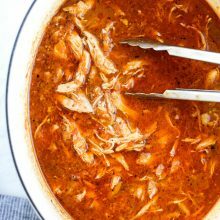 We enjoyed this recipe very much, but wanted to let you know that some of the directions were left out of the printable version at the bottom (the part about adding salsa, sour cream, and cilantro). Thanks for your work! Ah! Thank you, I’ll go add those in (sorry about that)! 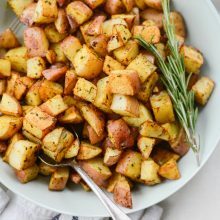 I’m glad to hear you enjoyed this recipe! So many beautiful pictures! Love that you made your own enchilada sauce. So hard to find a good enchilada sauce these days! Thank you so much for sharing! This is truly the absolute best thing I have ever made. It was unbelievable. Best enchiladas ever!! 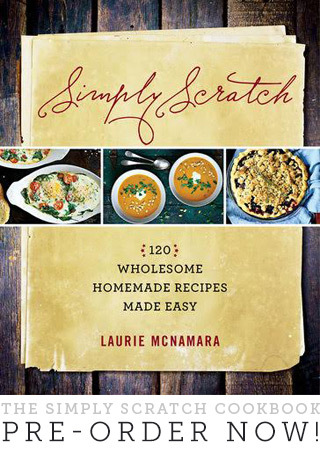 Laurie, thank you for such a FANTASTIC recipe! 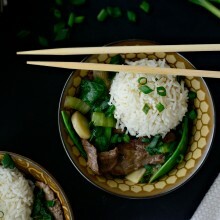 This is probably my husband’s favorite dish – ever. We easily make it once a month. Haha. One thing that we do as a garnish is squeeze fresh lime juice over them before we dig in.